An adolescent moose—still young and naïve—used to wander a circuit around the house where I lived one winter in Wilson, Wyo. He'd nibble the low-hanging tips of the willow tree outside our house looking like an elephant in a circus act, his ungainly front legs balanced on the top of the snow pile plowed into a mound in our driveway. The wild game was everywhere that winter. On my long ski outings down the dike along the Snake River, I'd often look through the trees, alerted by the scent of animal musk in the air, in time to see a half-dozen ghostly figures (a herd of elk) bounding away from my approach. These were animals not normally seen in or around town. Winter was particularly long and hard that year. Following their ancestral knowledge and animal instinct, they'd come into the valley, among the people—relative newcomers to the area in the scope of animal habitation—to where they knew the snow was not as deep. Everywhere in the West—in Utah as much as in Wyoming—houses are finding purchase where animals once grazed. Sometimes, it can seem like we live in harmony; isn't it nice to look out from our kitchen window and watch a deer chew grass on the lawn? But more often, the deer, elk and moose get the short end of the stick. Wildlife's greatest challenge today, according to the wildlife biologists who study them, is finding a safe home. In winter (and in summer), wildlife increasingly compete for range lands with urban development and agricultural interests. Winter's challenges—deep snow, scarce food and cold temperatures—make it an especially difficult and stressful time of year for the animals. When human presence disturbs wildlife, the situation worsens. Forced to move, animals expend much-needed energy, and mortality rates jump. 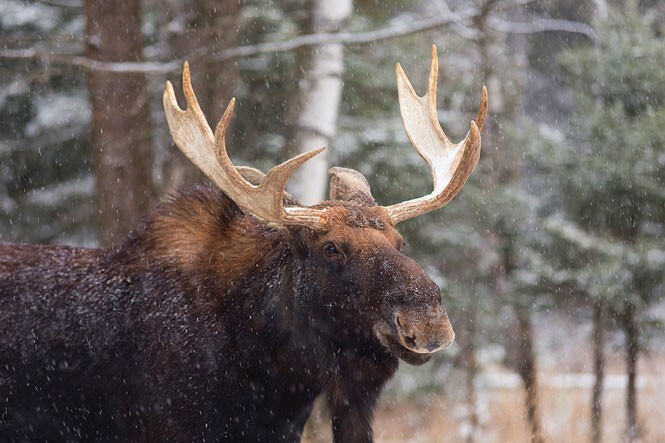 For those who like to get out in the snowy mountains for snowmobiling, skiing or other recreation, it's important to recognize and reduce our effect on wild animals. In Wyoming, programs like Don't Poach the Powder teach locals and visitors about seasonal closure areas, wintering grounds that are left to the elk and other creatures. When closing historical wintering grounds isn't a possibility, such as in areas where towns and cities are already established, other options are available. Here in Utah, one such solution lays across 14,000 acres in Cache Valley, just south of Logan. Hardware Ranch, a wildlife-management area (WMA) owned by the state and managed by the Division of Wildlife Resources (DWR), was established in 1945 as a permanently protectedwintering ground for the area's Rocky Mountain elk population. The preserve wasn't exactly where the elk normally migrated in the fall; that land must have been pretty choice, because it was exactly where the pioneers chose to build their houses and till their fields. To lure the elk to the new management area, the Division of Wildlife Resources began a feeding program of supplementing the herd's forage with hay, a practice that continues today. By now, the local herd—about 600 animals strong—knows exactly where to go. Each winter, as the snows move them out of the higher elevations, the elk trickle into Hardware Ranch. The concentration of elk every winter at Hardware Ranch makes it a perfect place for biologists to study the animals. Learning more about their biology and population dynamics hopefully will lead to improved herd-management techniques across the state. It also gives the Division of Wildlife Resources an opportunity to teach the public more about Utah's state animal. Starting in December and continuing until March, visitors to Hardware Ranch can take elk-viewing wagon rides through the management area. Moose, elk and deer sightings are no longer a daily winter reality since I moved back to the city. Sometimes I wonder if they are even out there in the mountains where I now recreate, but of course they are. And whether I see them or not, I'll be sure to try and give them the space they deserve.